Home \ OCTANE LOUNGE \ $3.5 M! As usual, the “Hemi” has proven itself to be king of the street and king of the auction block. The collector-car market continues to be white hot, with the latest car to sell for a jaw-dropping number being a 1971 Plymouth Hemi Cuda convertible that hammered for a world-record price of $3.5 million at a Mecum Auctions event in Seattle on June 14. All told Plymouth sold 50,617 Barracudas, including 652 Hemi Cuda coupes and 14 Hemi convertibles, when the model was totally redesigned for 1970. But that would prove to be the model’s high-water mark of the muscle-car era. 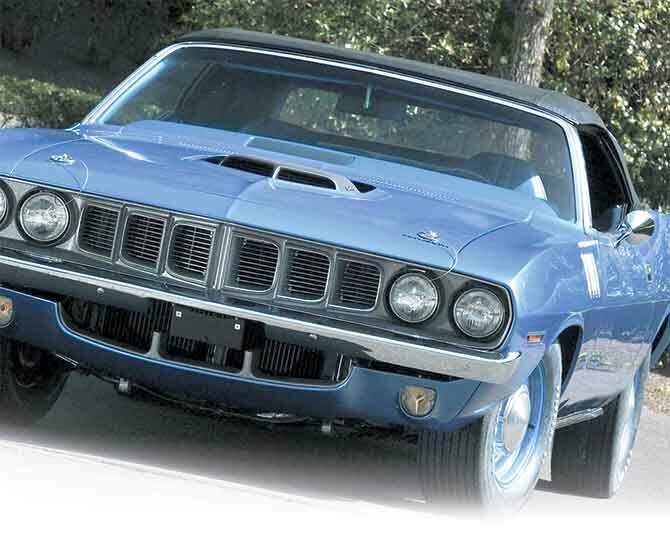 Total Barracuda sales plummeted to just 16,159 units in 1971, with just 108 coupes and 11 convertibles carrying the 426-cubic-inch “Hemi” powerplants. And one on those 11 ’71 Hemi Cudas just made some serious money for its former owner. 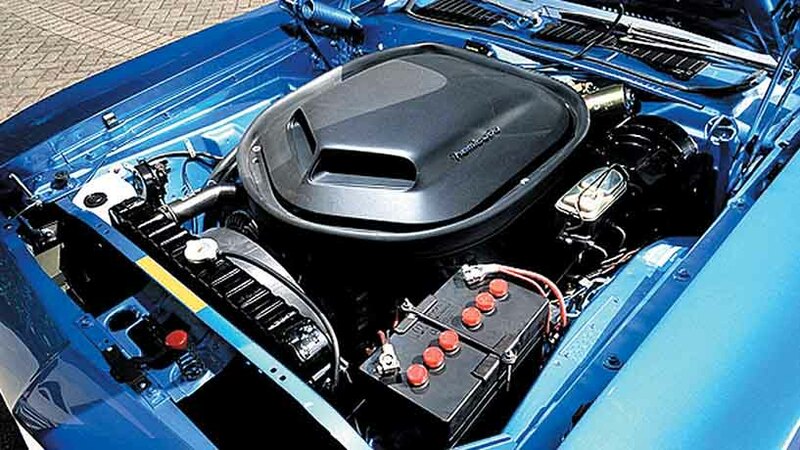 The record-breaking blue-on-blue Hemi ‘Cuda checked all the right boxes: it was a convertible, one of only 11 built with the ground-pounding 425-horsepower V8 in 1971. 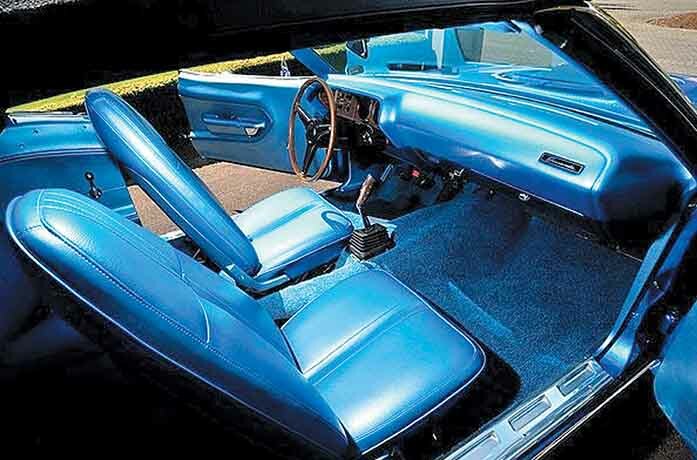 In addition, it was one of just two of the 11 built with a four-speed manual transmission, instead of the more common Chrysler Torqueflite three-speed automatic. Most importantly, it was verified as the only surviving ’71 Hemi Cuda with its matching-numbers powertrain, meaning it still has the same engine, transmission and rear end it had when it rolled off the assembly line at Chrysler’s Hamtramck, Mich. facility. Other goodies include power brakes; attractive “B5” Bright Blue paint, with a matching blue high-back bucket-seat interior and black power top; white-letter Goodyear Polyglas tires on steel rims with dog-dish hubcaps; a “Shaker” cold-air induction hood scoop that mounts on top of the two four-barrel carburetors; Dana 60 rear end with 4.10 gear ratio as part of the “Super Track Pak” option; Hurst Pistol Grip shifter; and the Rallye Instrument Cluster with 8,000 RPM tachometer, 150-mph speedometer, oil, temperature and alternator gauges and clock. And while it’s hard to put an estimate on how much or how little this might have affected its value, this Hemi Cuda comes with a great story. It used to belong to an American cartoonist named Russell Myers, the creator of the popular Broom-Hilda comic strip that was first published on April 19, 1970. After the drug-seizure auction, the new owner took the car to noted Los Angeles, Calif., Mopar restorer Julius Steuer, who finished it some point near 2000. It was subsequently traded for a number of vintage Corvettes to the owner who auctioned it off at Mecum Seattle. “A well-documented and fully restored example of this most coveted of factory muscle cars, this 1971 Hemi Cuda convertible, one of just two four-speed versions delivered in the U.S., has been hailed by enthusiasts, collectors, journalists, researchers and appraisers as the Holy Grail of muscle cars,” Mecum noted in its catalog. The Holy Grail of muscle cars, maybe, but in truth the 1970-’71 Cuda and its sister car, the Dodge Challenger, were pretty much single-purpose vehicles when equipped with the ponderous but powerful Hemi engine. And that single purpose was going fast in a straight line. With all that weight over the nose, handling and braking were dicey at best, and the two huge four-barrel carburetors really sucked back the fuel. But now, real Hemi Cudas and Challengers fetch huge money. Plymouth, of course, is long defunct, but you can purchase a brand-new 2014 Dodge Challenger SRT8 with a modern take on the Hemi engine for an MSRP of $46,680. The new Challenger was retro-designed to look like the old car, but it’s vastly superior to an original Hemi Cuda or Challenger in every respect: faster, more fuel efficient and less polluting, with better braking, better handling and far more in the way of safety features and day-to-day driveability. But if you want an original, especially a convertible, the new price benchmark has been set. And so far, the inevitable market correction in vintage-car prices still seems a ways down the road. At least that’s what today’s collectors are banking on. If this restored Hemi Cuda was worth $3.5 million, how much would a low-miles unrestored car be worth? If you like your modern Dodge Challenger with its 392-cubic-inch Hemi, then you have cars such as the original Hemi Cuda to thank. Although a relative pittance when compared to what the originals bring at auction, at least you can daily drive a 2015 model. This car was once owned by the creator of the Broom-Hilda cartoon strip. It was later sold to a buyer in Oregon and it was eventually seized in a drug investigation.